The U.S. Senate race in Massachusetts is currently among the closest in the country, with the most recent polls showing a razor-thin lead by Democratic challenger Elizabeth Warren, who hopes to unseat Republican incumbent Senator Scott Brown this November. The Massachusetts race is unique among national Senate races, as outside money is playing a significantly diminished role thanks to a pledge signed by both candidates that has helped keep outside spending on television, radio, and Internet ads in check. The pledge cannot directly restrict groups from running ads, but rather punishes the Warren or Brown campaigns if an outside group runs an ad supporting them. The pledge states, "In the event that a third party organization airs any independent expenditure broadcast (including radio), cable, satellite, or online advertising in support of a named...Candidate, that Candidate's campaign shall...pay 50% of the cost of that advertising buy to a charity of the opposing Candidate's choice." Early in the race, it appeared Brown would benefit most from the pledge, due to his impressive early fundraising numbers, which showed him slightly ahead of Warren. Now, Brown is losing the campaign finance war, with Warren $7 million ahead in fundraising as of October 11. Despite the closeness of the race, the pledge appears to be holding. Since it was signed, national outside groups have dialed down their involvement in Massachusetts, though many are still moving money into the state, using less noticeable methods to influence elections: robocalls, direct mail, and get out the vote canvassing. The clearest violation of the "People's Pledge" was an ad campaign from the American Petroleum Institute (API), which ran radio and print ads in March as part of its $4 million dollar, seven state "issue ad" campaign telling listeners to call their senators and ask them to vote against a bill proposed by President Obama that would have ended tax breaks to big oil companies. 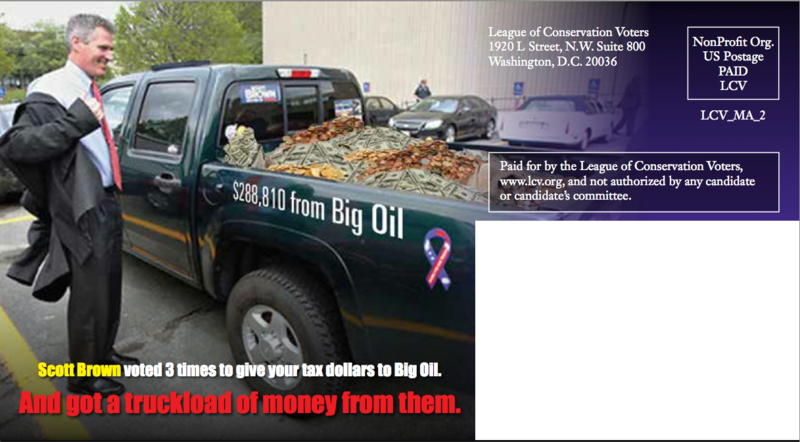 Their radio ad encourages Massachusetts voters to "Tell Senator Brown higher taxes won't lower gas prices." API also ran print ads that made similar requests. Because Brown supported the continued subsidies to oil companies, the Warren campaign charged that the ads violated the pledge. Though the Brown campaign initially claimed the ad was an "issue ad" and outside the scope of the pledge, Brown eventually conceded that API's spending was a "loophole," and that, "Closing this loophole is an important step toward keeping outside groups from influencing the Massachusetts election." The campaign donated $35,000 to the Boston-Based Autism Consortium. Brown also had to make a $1,000 donation to the same charity in response to web ads by CAPE PAC, a SuperPAC which earlier this year drew criticism from both Republicans and Democrats for raising money off of websites designed to look like official campaign websites for Republican candidates. While they have yet to run an ad in Massachusetts, the pro-GOP Crossroads GPS and their SuperPAC counterpart American Crossroads run by Karl Rove have been conducting a massive robocall campaign on behalf of Brown. As a 501(c)(4), Crossroads GPS is technically a "social welfare" organization, though it does almost nothing besides run ads against Democrats or in support of Republicans. Due to its tax status, Crossroads GPS does not have to report its donors. The groups have thus far spent $174 million influencing the 2012 election, making them one of the most powerful outside-money groups. According to Open Secrets, Crossroads GPS has spent $215,875 attacking Warren, with their entire Massachusetts budget going toward an extensive robocall operation. GPS robocalls contain a pre-recorded message which targets Warren for supporting "President Obama's Health-Care takeover," which the call claims will "cut over $700 billion from Medicare spending," two false claims that Crossroads GPS has been repeating in races throughout the country. Both claims have been systematically debunked by fact checking organizations; one even named the "government takeover of healthcare" trope its "Lie of the Year" in 2010. GPS is also running a robocall attacking Warren for supposedly mismanaging the funds of the Congressional Oversight Panel (COP), a panel set up by Congress to watchdog the Troubled Asset Relief Program, or TARP bailout, on behalf of taxpayers in the aftermath of the financial crisis. Warren chaired the panel from 2008 to 2010 and was famous for grilling Tim Geithner and other top administration officials about their handling of the bailout and the failure of the programs designed to help homeowners. She has since been an advocate for releasing all of the COP's own budget and spending information. Crossroads GPS has been targeting Warren for her leadership of the panel since 2011. GPS ran ads in Massachusetts linking Warren, a college professor, to Wall Street bailouts as if she were doling out the money. As a member of the COP, Warren and her bipartisan panel critiqued the various TARP programs, but did not control any aspect of the TARP money, as the ad seems to imply. GPS's claim is even more bizarre in that it came less than a month after airing ads that portrayed Warren as an enemy of Wall Street due to her support of the Occupy movement. GPS spent over a million dollars in November and December of 2011, before the pledge was signed. Direct mail has provided another avenue for direct attacks, as the pledge only punishes candidates benefitting from broadcast advertisements. Warren has been the beneficiary of $700,000 in outside spending from the League of Conservation Voters, an environmental nonprofit that runs smaller state chapters in 30 states, including Massachusetts. The League is sponsoring a $200,000 direct mail campaign that they hope will reach as many as 150,000 likely voters. The mailers attack Brown for accepting $288,000 from oil companies to fund his campaign, and, in return, refusing to end oil subsidies. The mailers were published by the League's PAC, which reports its donors. The League is also running an ongoing "get out the vote" initiative, on which they have spent $500,000 so far. The League's press secretary Jeff Gohringer said the campaign was expressly "designed to defeat Scott Brown and elect Elizabeth Warren." According to their latest press release, the League plans to spend over $1 million influencing the Massachusetts Senate race. Warren has also benefitted from direct mail campaigns launched on her behalf by the AFL-CIO. Their mailer attacks Brown's credentials as an independent Republican, featuring a blue-collar worker on the job with a caption that reads, "Important Union Message: Scott Brown says one thing and does another. He's not Independent at all. He says he's for the middle class, but votes against us every time." The cost of the AFL-CIO's campaign has not been reported. For Brown, he has received around $200,000 in support through direct mailings from American 360, a previously unknown Super PAC. The group has only recently reported the donors supporting it: it received the vast majority of its funds from Oxbow Carbon, an oil and coal company founded by William Koch, a younger brother to Charles and David Koch. Oxbow Carbon and William Koch have been major supporters of the Pro-Romney superPAC Restore Our Future, they have given the group $2 million in 2012. America 360's mailer encourages absentee voters to "stand up for our independent voice," and features a picture of Brown. The mailer also attacks Warren, claiming, "Her plan is to raise taxes on small businesses, increase spending, and put burdensome new regulations on our jobs creators." Grover Norquist's Americans for Tax Reform (ATR) has also issued mailers in support of Brown, recently spending $162,418 on a direct mail campaign. ATR reports that it has spent upwards of $400,000 on three separate direct mail buys this year attacking Warren. Americans for Tax Reform is organized under section 501(c)(4) of the tax code, meaning it does not disclose its donors. 501(c)(4) nonprofits may spend on electoral activity so long as directly influencing elections is not their primary purpose. ATR has declined to comment on the content of the mailers. Other outside money groups may be doing robocalls and direct mail and not disclosing their activities, so a full accounting of all outside money activities may not be possible. As election day approaches in Massachusetts, both sides have accused each other of violating federal election law, as well as the spirit of the pledge. Brown's campaign has filed a complaint with the FEC alleging that Warren colluded with the AFL-CIO, whose president, Richard Trumka, has campaigned closely with Warren. Brown's campaign alleges that the two colluded in order to "launch a direct mail campaign attacking Senator Scott Brown." Similarly, the Massachusetts Democratic Party filed a complaint with the FEC suggesting Brown plans to break the pledge with support from Karl Rove. The Boston Globe reported that Brown was seen meeting with Karl Rove at a Tampa restaurant during the Republican National Convention. The Brown campaign says that the meeting was simply "a chance encounter." The article also reports that Rove has produced at least one ad for Massachusetts, though it has not been broadcast. Open Secrets estimates that reported outside spending in Massachusetts totals just over $2 million dollars, significantly below the totals of many other close senate races like Ohio (which has topped $18 million), or Wisconsin (which, including the Republican primary, is at $20 million). With the race this close, and control of the U.S. Senate at issue, it remains to be seen if the unique broadcast pledge will last until election day and whether it will serve as a model for other candidates in this Citizens United era of massive, largely undisclosed, outside spending. Submitted by Anonymous (not verified) on October 20, 2012 - 3:06pm. Crossroads GPS ads have been airing frequently on the Haverhill, MA based 92.5 The River radio station.